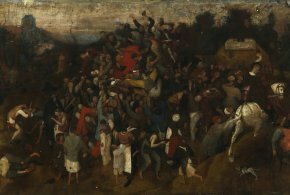 28/9/10 – Discovery – Madrid, Museo del Prado – The Museo del Prado has just announced that it rediscovered an unknown painting by Pieter Brueghel the Elder representing a village festival the day of Saint Martin , when new wine was tasted (ill. 1). A very complete study of this painting has been posted on the museum’s internet website. The work had been published and reproduced only once, by Matias Diaz Padron, a former curator at the Prado, in the journal Archivo Espanol de Arte , as being by Pieter Brueghel the Younger. The composition was known by an engraving in reverse commissioned by Abraham Brueghel  with a letter indicating Jan ‘Velvet’ Brueghel as the author of the composition. It would seem then that the engraver (he signed N. Guerard) worked from a copy of the original. The Musée des Beaux-Arts of Brussels in fact owns a copy of this painting, bearing the monogram AB [? ], probably painted by Abraham. Finally, the Kunsthistorisches Museum in Vienna has a fragment of a painting in its collections, representing the right portion of the composition, at times considered as being perhaps by Pieter Brueghel the Elder but more generally as a copy by Pieter Brueghel the Younger or Jan ‘Velvet’ Brueghel. The Wine of Saint Martin’s Day is being restored and all of the specialists are unanimous in saying today that this is an original by Pieter Brueghel the Elder. 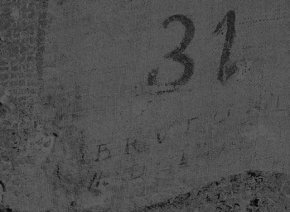 His signature has just been uncovered, and corresponds to that found on several of his other paintings (ill. 2). The first letters of a date in Roman numerals (MD) appear next to it. This is a major discovery for art history. Although there are a great number of Brueghel paintings on the art market, those by the father of the family dynasty are almost all in museums (only three are in the hands of private collectors). The Prado, which already owns one Brueghel (The Triumph of Death) and which holds an option to purchase this one, is determined to take advantage of this unique opportunity for acquiring a second one. The Feast of Saint Martin falls on 11 November. Matias DiazPadron, “La obra de Pedro Brueghel el Joven en Espana”, Archivo Espanol de Arte, LIII (1980), pp. 289-318. Abraham Brueghel is the son of Jan Brueghel the Younger, who was himself the son of Jan ‘Velvet’ Brueghel, in turn the son of Pieter Breughel the Elder and the brother of Pieter Brueghel the Younger.